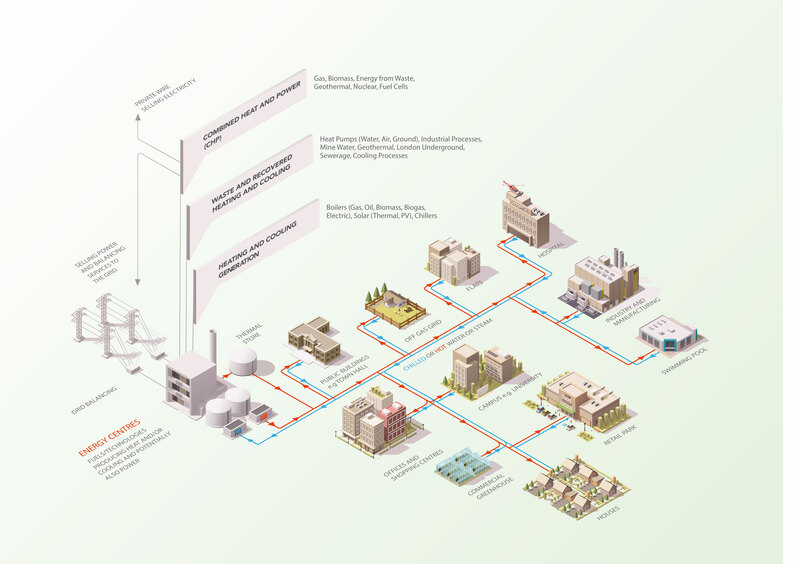 Launched by The Department for Business, Energy and Industrial Strategy (BEIS) during Green Great Britain Week, the Heat Networks Investment Project (HNIP) is a major Government project which will invest up to £320m of capital funding in heat network projects. The scheme is now open for applications. For more information about the scheme opening, please read our press release here. Applications received after this date will be considered in the second and subsequent funding rounds that will continue on a quarterly cycle until the scheme closes. Applications (and pre-applications) for HNIP funding can be made at any time so please get in touch if you are thinking about applying. Applicants are encouraged to apply for pre-application as early as possible and to complete their applications as soon as their project is sufficiently developed. BEIS and Triple Point Heat Networks Investment Management (TP Heat Networks) have jointly published Application Guidance and an Application Form. The guidance document enables applicants to understand the application process from start to finish, including how the scheme will operate, the eligibility criteria, how applications are to be made and how they will be scored and assessed. The two-stage application process involves a pre-application to ensure that projects applying for funding meet the HNIP eligibility criteria and is followed by a full application to the scheme. Only successful pre-application projects will be eligible to submit a full application – this is to ensure that only high quality schemes are awarded HNIP funding (which is offered as ‘gap funding’ through a combination of grants and loans). Projects that meet the HNIP minimum requirements set out in the pre-application stage will move on to full application, where the projects will be assessed against the HNIP scored criteria as part of a competitive process. Projects being considered for HNIP funding will be assessed to establish which best demonstrate value for money and contribution to the aims and objectives of the HNIP scheme. The Application Guidance and Application Form can be found at the below links. Please read all documents carefully before submitting an application. To submit an application, download the application form above, complete it and send to apply@tp-heatnetworks.org. Experienced Business Development Managers (BDMs) are available to support applicants prior to and during the pre-application stages of the application process. Applicants are actively encouraged to engage with BDMs at the earliest practicable opportunity in order to derive maximum benefit. To discuss an application in more detail and to speak to one of our BDMs, please contact us via our contact form or by email to enquiries@tp-heatnetworks.org. Heat Networks have been proven around the world as a reliable, cost-effective and low carbon means of providing heat, yet in the UK just 2% of buildings are heated in this way. The Department for Business, Energy and Industrial Strategy (BEIS) has appointed Triple Point Heat Networks Investment Management to the role of Delivery Partner for the Heat Networks Investment Project. We are comprised of a group of professional firms with a demonstrable track record of engaging with investors and supporting project developers to deliver a wide range of infrastructure projects. Triple Point Heat Networks Investment Management is excited to be working alongside BEIS to deliver affordable and dependable low-carbon heat across the country. Using a mix of Government and private sector funding, we will help to build a self-sustaining and transformative heat energy market for the future. We are now open for business and ready to work with project sponsors, developers and investors. Over the next three years we will deliver £320m of Government support to individual projects across England and Wales as part of the HNIP main scheme, leveraging around £1bn of private and other capital in order to provide much needed scale to this market. The impact of this funding should be felt across the UK. Heat network construction in towns and cities will support jobs in engineering, construction, energy management and design. At the same time, many projects will be integrated into broader urban renewal and redevelopment – contributing not just sustainable heat and power but also to an understanding of place and pride in the local environment. Large scale commercial investment is critical to the development of this market and this will be a major area of focus for the Delivery Partner team as we seek to create the right conditions and connections between project sponsors, developers and investors from the UK and around the world who may be able to support them. From the outset we are clear on the need to ensure that projects are well-designed, commercially viable and beneficial for consumers. We are committed to a vision, shared with the Department for Business, Energy and Industrial Strategy (BEIS), to create a transformed, self-sustaining and trusted market which offers affordable and reliable low carbon heat. This will be delivered through projects which are investable, strategic, future-proofed, transparent and in the right place at the right time. For more information, please read our latest press release here. For more information on the each of the Delivery Partner firms please click here.